We've taken a look at some of the top Android airline apps in the past, as well we have a great list of Android travel tips accumulated from our many ventures in the air. If you're going to be traveling, be it on business or vacation we've got the guides to help make things easier. 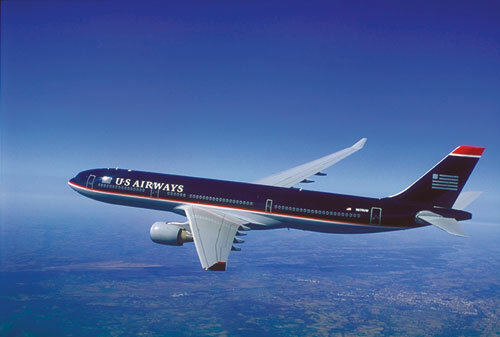 Full press release from US Airways can be found past the break and if you need more info -- check out the US Airways website link below. NCR Mobile Boarding Pass Solution Improves Passenger Experience for US Airways Customers in 14 Airports Throughout U.S.
DULUTH, Ga.--US Airways is helping speed up the check-in process and improve convenience for its customers with mobile boarding pass technology from NCR Corporation (NYSE: NCR). Following check-in, customers receive an email containing a digitally signed and encrypted 2D bar code that is compatible with current imager-based airport scanners and boarding gate readers. Customers are able to scan the mobile boarding pass at the kiosk if necessary or bypass check-in lines and head straight to the security checkpoint where the electronic bar code is scanned and validated. The bar code can then be used at the gate for boarding. US Airways first piloted NCR Mobile Pass at McCarran International Airport in Las Vegas and at Charlotte Douglas International Airport in Charlotte, N.C. starting in December 2010. It is now available in 14 U.S. airports, including LaGuardia International Airport in New York and Ronald Reagan Washington National Airport in Washington, D.C., and plans to further expand the offering in 2011 are underway. According to a 2010 survey conducted for NCR by Buzzback Research, 48 percent of U.S. travelers who use their mobile phone for travel information and transactions also use their mobile phone to check-in for flights, and 45 percent access itineraries and reservations. In fact, according to Juniper Research, one in every seven bar-coded boarding passes worldwide will be delivered to passengers' mobile devices within two years. US Airways has distinguished itself by deploying the most advanced self-service solutions for travelers. The airline was recognized at the annual KioskCom Self-Service Expo as the 2010 Self-Service Excellence Award winner in the "Best Travel/Hospitality Deployment” category for improving the passenger experience by extending self-service check-in outside the terminal. NCR is the leader in mobile check-in, issuing more than 1.2 million mobile boarding passes in July, 2011, as well as the industry leader in Common Use Self-Service (CUSS) airline kiosks.